Happy Easter Friends! Jacob was up at the crack of dawn as usual, which gave us plenty of time for our traditional bunny cinnamon rolls before church. These always turn out so cute. I just take half of the rolls from the can, unroll them and cut them in half. Then I fold each half into a U shape and pinch them onto the top of a roll to make ears. 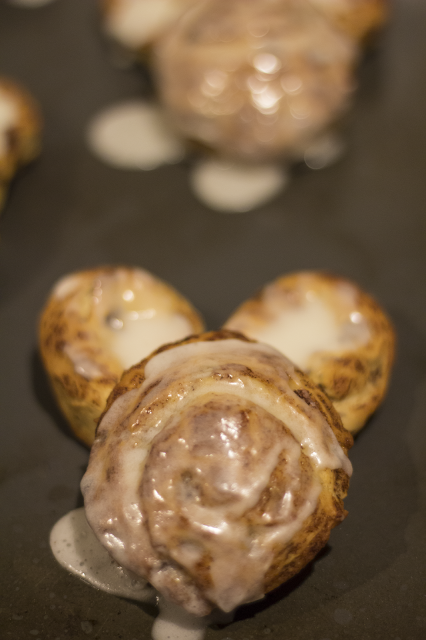 They fluff up a bit in the oven, and are so yummy with lots of sweet icing spread on top. Sometime in between breakfast and his Easter basket there was a scraped toe while helping to walk the dogs and a colossal meltdown. If you look close you can see the hole in his cute PJs. Thankfully a bandaid and an Easter basket were enough distraction to cheer him right up! I absolutely love putting together the Easter basket. I generally start right after Valentine's and collect little things here and there that I know he will love. He was especially excited about the beach toys, the kiddie chopsticks, the SING DVD and the chocolate frogs. Jacob takes his time with his basket, pulling one thing out at a time and looking it over before moving on to the next thing, which I love. He loves pulling apart eggs and seeing what's inside. This year I filled his eggs with fruit snacks and a key chain. He somehow knew immediately that keychains can go on backpacks and started saying "take it to school." I guess we'll have to put it on his little preschool backpack in the fall! After church Jacob got to visit with the Easter bunny and had everyone in hysterics as he instructed the Easter bunny to smile for the photos. "Say cheese bunny! Say cheese!" We also got an elusive family photo, which always makes my heart sing. There were long naps for all after church while the ham cooked in the oven and then it was off to the airport to pick up Nonna. This was my first time hosting Easter dinner and along with the ham we had Parmesan potatoes, herb roasted carrots, deviled eggs, and then macaroons and salted caramel gelato for dessert. Both the macaroons and the gelato were from Trader Joes, and this definitely won't be the last time we buy them! That night we opened our last story egg, empty like the tomb and Nonna got to read the Easter Sunday passage to Jacob. Such a special tradition that we'll be using for years to come! I hope you all had a wonderful Easter with your loved ones!